The spotted redshank (Tringa erythropus) belongs to the family of sandpipers and redshanks, the Scolopacidae. The spotted redshank species is distributed in northern Eurasia, Mediterranean region, Middle East, Africa, India and southeast Asia. These redshank species breed in arctic and subarctic zones. These redshanks are monotypic species. The spotted redshank (Tringa erythropus) is a large wader, measuring 30 to 33 cm in length and weighing 100 to 230 grams. The wingspan is 60 to 65 cm. The breeding spotted redshank is blackish with white spots and speckles on the upperparts. The wintering birds are gray with white patterns. They have black or dark gray lore and cap. The bill is long and half red and half black in color. The irises are blackish. There is white orbital skin. The feet are long and orange red in wintering birds. The call of these redshank species is a short, whistling "tee-u" or a rapid alarmed "kyip-kyip-kyip" sound. 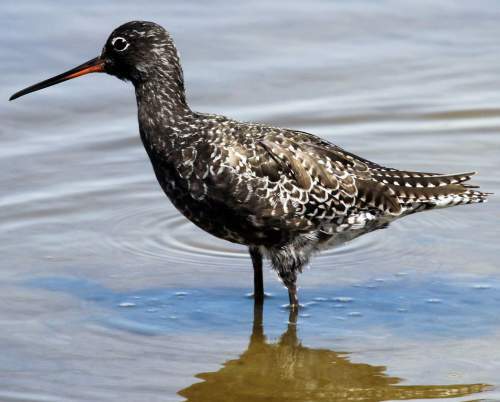 The breeding populations of the spotted redshank are distributed in Norway, Sweden, Finland and northern Russia. The wintering redshank populations are distributed in southern Europe, western Europe, Mediterranean region, Middle East, Africa, Pakistan, India, Sri Lanka, southeast Asia and southeast China. In India, wintering spotted redshanks are distributed in the states of Gujarat, Rajasthan, Haryana, Punjab, Uttar Pradesh, Madhya Pradesh, Maharashtra, Telangana, Odisha, Andhra Pradesh, Tamil Nadu, Kerala, Karnataka and Goa. The Important Bird and Biodiversity Areas (IBA) of these spotted redshanks in Russia are, Lapland Biosphere Reserve, North-east Sakhalin lagoons, Valley of headwaters of the river Schuchya, Tyk and Viakhtu bays and Upper and Middle Yuribey. The IBA of the spotted redshank species in Finland are, Saariselkä and Koilliskaira, Pori archipelago, Pomokaira-Koitelaiskaira, Oulu region wetlands, Lemmenjoki-Hammastunturi-Pulju, Kevo and Käsivarsi fjelds. The IBA of the spotted redshank species in Norway are, Varanger Peninsula, Røst, Reisa, Øvre Pasvik and Øvre Anárjohka. The IBA in Pakistan are, Indus Dolphin Reserve and Kandhkot wetlands and Taunsa Barrage Wildlife Sanctuary. These spotted redshank species have low forest dependence. They normally occur in altitudes from 0 to 100 meters. The artificial ecosystems and habitats of these species include agricultural fields, flooded pasturelands, ponds and water storage areas. The natural ecosystems and habitats of these spotted redshank species include, flooded grasslands, tundra grasslands, boreal forests, subarctic shrublands, freshwater lakes, rivers, streams, estuaries, marshes, mudflats, marine lakes and lagoons. The diet of this spotted redshank consists mainly of invertebrates. Small crustaceans, molluscs, worms, insects, insect pupae and larvae, beetles, aquatic insects, amphibians and small fish are their primary food. The breeding season of these spotted redshank species is during April and May in most of their breeding range. These species are monogamous and territorial. The nesting sites of the spotted redshanks include open boggy taiga, heathland, shrub tundra, wooded tundra and open tundra. The nest is a shallow scrape on dry grass or sphagnum moss. The clutch contains 3-4 eggs. These spotted redshank species are migratory birds. Breeding populations occur in Arctic and subarctic zones, spanning northern Europe and northern Asia. The female spotted redshanks migrate southwards during June and the males migrate in July. The juveniles migrate during August to September. They reach the wintering grounds from August onwards. They return to the breeding grounds in April and May. The global population size of the spotted redshank (Tringa erythropus) is estimated to number about 110,000 to 270,000 individual birds. The overall population trend of the species is considered to be stable. In most of its range, this redshank species is reported to be locally common to uncommon. The generation length is 5.6 years. Its distribution size is about 7,360,000 sq.km. Habitat alteration and destruction, climate change, severe weather, hunting and capture of adults and juveniles for pet-trade are the main threats that are endangering the survival of these redshank species. The spotted redshank (Tringa erythropus) does not approach the thresholds for being Vulnerable, either under the range size criterion, or under the population trend criterion or under the population size criterion. 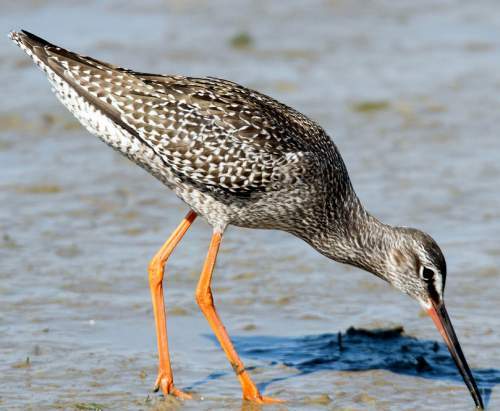 The IUCN (International Union for Conservation of Nature) has categorized and evaluated the redshank species and has listed it as of "Least Concern". The CITES (Convention on International Trade in Endangered Species of Wild Fauna and Flora) status is ‘Not Evaluated’ for the spotted redshank (Tringa erythropus). The spotted redshank (Tringa erythropus) is a monotypic species. Current topic in Birds of India: Spotted redshank - Tringa erythropus.